TAKATO (TAKATŌ) Yoritsugu was a local ruler of Suwa, Shinano. He was the lord of Takato Castle (*) and the head of the Takatos, branch family of the Suwas . After SUWA Yorishige surrendered to TAKEDA Harunobu, Suwa region was divided into two parts and Yoritsugu ruled the western part. However, he invaded into the eastern part with FUJISAWA Yorichika, lord of Fukuyo Castle in Shinano but beaten by the Takeda Army. His younger brother Renpoken was killed in the battle. In 1545, his castle fell to Harunobu and he was ordered to go to Kofu. And in 1548, Harunobu was beaten by MURAKAMI Yoshikiyo at Uedahara and ITAGAKI Nobukata, representative of Suwa county died in it. Then some of Suwa people raised an army but he returned to Takato Castle in April, 1548. After that he served Harunobu but was ordered to commit hara-kiri in 1552. His castle was reconstructed later. Takeda katsuyori became the lord of the castle momentarily. In this series, he is described as a small-time man who is easily deceived. After the fall of Takato Castle, he escaped to Hayashi Castle where OGASAWARA Nagatoki, shugo of Shinano lives. He asks Nagatoki for his cooperation to attack Harunobu and take back Suwa but fails. (*) The castle is famous for cherry blossoms. SAKAKIBARA Yasumasa was one of the superior vassals of TOKUGAWA Ieyasu. Though his family served the Sakai Family, not the Matsudaira clan but he became to serve TOKUGAWA Ieyasu who is descended from the clan. He was versed in letters and arms and became Ieyasu's page in 1560. Though he had an elder brother called Kiyomasa, he became a heir and succeeded his father Nagamasa. When he celebrated his genpuku, he was given the letter of "Yasu", one of the letters from the name of Ieyasu. He renders distinguished services in some battled includes the Battle of Nagashino. Especially he performed great exploits in the Battle of Komaki and Nagakute in 1585. After Ieyasu moved to Kanto region, he became the lord of Tatebayashi Castle in Kozuke and improved the infrastructure of the town such as building an embankment. In 1600, he joined the army of TOKUGAWA Hidetada and arrives late at the Battle of Sekigahara. Some say that he was ordered to move to Mito but he refused he performed no exploits in the battle and it was easy for him to go to Edo from Tatebayashi. He died of folliculitis in 1606. He was closed to HONDA Tsdakatsu, who was the same age with him and II Naomasa. In this series, he is described as a man who is understanding and calm. He is a faithful man and sometimes mediates between Ieyasu and Manchiyo. AKASHI Teruzumi draws Nobushige and KATAGIRI Katsumoto together. Katsumoto is expelled from Osaka Castle. A little while ago, He was ordered to explain the meaning of the inscription on the bell of Hokoji Temple to Ieyasu. There are some words that mean the misfortune of Ieyasu and the prosperity of the Toyotomi clan. Katsumoto wasted time in Sunpu. While he stayed in Sunpu, Okurakyo no Tsubone visited there and talked about it with Ieyasu. He planned to cajole her out of discussing it so she insisted that there was no reason to worry. Though Katsumoto said that he schemed for something, she would not listen to it. Finally he was expelled and Ieyasu regarded the relationship between them had cut. 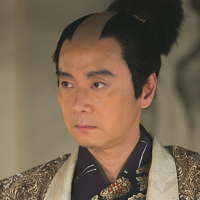 Katsumoto asks Nobushige to participate in the war of the Toyotimis and the Tokugawas. But he refuses it and returns to his house where Kiri is waiting for him. She urges him to join them and says that there is someone who needs him repeatedly. Though her words irritates him, he thanks for her that gives him a boost. He changes his name from Nobushige to Yuykimura. Yuki is the letter his brother abandoned when he changed one of the letters in his name (:). And mura is after Kudoyama mura (village). Yukimura tells TAKANASHI Naiki, Sasuke, Haru and Kiri that he will escape from Kudoyama and enter Osaka Castle to take the side of Hideyori. Ieyasu also knows that there are many ronins gather in the Castle. So Kudoyama becomes to be watched strongly. And SANADA Nobuyuki makes Nobuyoshi as his heir and in case a war occurs, he will lead the Sanada clan but Nobumasa is dissatisfied with it. One night Yukimura invites the villagers and TAKEMOTO Gidayu who is in charge of watching them. He and his family, Naiki, Kiri and Sasuke dance Karigane odori (**) and they go out of the room one by one and never appeared in front of them again. Then they hide themselves in an abandoned temple and depart for Osaka secretly. Yukimura disguises himself as an old man and enters Osaka Castle. There are many ronins who were famous daimyos or samurais but beaten in the Battle of Sekigahara. 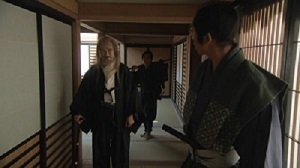 Yukimura takes off his kimono and wig and wears Kamishimo to greet Hideyori. He throws out his chest in front of Hideyori and manages the transport of provisions. Hideyori feels reassured about it. Nobushige meets Chacha for the first time in fourteen years. Her uncle ODA Urakusai, who occasionally counsels her says that he is useful in some cases. Hideyori gives him a room but he refuses it and applies for a shared room. Then he live in a room with CHOSOKABE Morichika. His family and vassals are given several rooms apart from that. Ieyasu dispatches his army to Osaka led by TOKUGAWA Hidetada. And Sasuke delivers Yukimura’s letter to Nobuyuki in Edo and brings HOTTA Sakubei to Osaka though stopped by Nobuyuki. Sakubei goes to Osaka after the marriage of his niece Sue. At Osaka Castle, Yukimura is offered to become a general of his army. 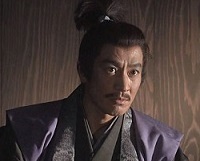 At the war council in the castle, ONO Shuri Harunaga announces that Hideyori hopes that Yukimura will lead the army but it is refused by GOTO Matabei. The council becomes uncontorollable and results in dividing the ronins into five troops and each of them has it own leaders (The Osaka Five). Though TAKANASHI Naiki worries about it, Yukimura says that their ambition is strong and is different from the soldiers of the Tokugawa Army in this respect. (*) In regard to this, please see the episode 37 "Nobuyuki"
(**) A local dance of Shinano. KO (Sei-in in) dances it in the wedding ceremony of Nobushige (Yukimura). SANADA Yukimura (Masato Sakai, left) who disguises himself as an old man enters Osaka Castle. The image is from the DVD series of "Sanada Maru"
copyright © 2017 ベイカー寮221B／Baker House 221B all rights reserved.